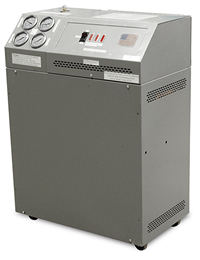 ADVANTAGE Trooper negative pressure units work with your central plant chilled or tower water to covert positive pressure from these systems to negative pressure within the cooling channels of the mold. Negative pressure allows air to enter the cooling channel to prevent water from leaking out... air is vented from the unit through an automatic purge device. Process Temperatures: 20°F to 180°F. Available Process Pump HP: ½ to 2. To and from mold pressure gauges. Supply and return pressure gauges.